One of the most impressive features that we didn't get to see tonight is the ability to completely disable apps. Essentially this spells an end to resource-hogging bloatware, since users can keep individual apps from ever running, opening tasks, or using resources. It even hides the app's launcher icon. This is a pretty clever move on Google's part, providing a nice response to user complaints surrounding carrier (and manufacturer) bloatware that, until now, users were stuck with, unless they decided to root their device. Another huge development for Ice Cream Sandwich is the ability to fully encrypt your phone's data. This feature was made available for tablets with the introduction of Honeycomb, but it looks like ICS will bring it to phones as well, though it isn't clear what cryptographic standards will be used. At any rate, this should be a relief to business users concerned about data security. Morrill went on to discuss several other tweaks that we'll see with Ice Cream Sandwich, which just add that much more polish (and functionality) to the user experience. The settings menu has been "seriously revamped," evidently enhancing the organization of each menu greatly. Besides that, Morrill explained that, in most cases, it takes fewer actions to find what you're looking for. Additionally, the download manager has been redone, making it easier "to see and clear any downloads you might have." Finally, Morrill mentioned a new audio effects API, but didn't give up any further details. 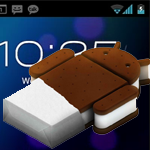 While these unexpected features extend the list of awesome goodies we'll see with ICS even further, I have a feeling we still haven't quite found out all there is to know about Android's newest iteration.